Yesterday, Google launched Search Plus Your World, which caused quite a stir among the SEO and Social Media world. These new features which are aimed at improving search do so by placing ‘your world’ within the results meaning much greater personalisation, by including your social connections content related to your search. Below I have briefly outlined the features as well as looking at some thoughts from the industry. I won’t go into too much detail with regards to the main features that will be added, but the main addition is the true personalisation of search results. The results will focus on showing relevant Google+ posts from friends within your circles such as photographs, videos and links about any recent goings on from within your social interactions. It doesn’t stop here and will also show content from other relevant sources which Google can access. You can search a mix both personal and normal web results, just from within your own world, or the whole web without excluding personal results. Using this looks very intuitive and streamlined even though this feature is very much in its infancy and sure to be refined further. I expect to see additional settings allowing you to only select certain circles that can affect results; this being more useful at certain points of the day you may be interested in different people’s opinion, depending on what you are searching for. 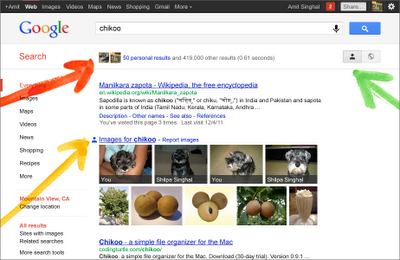 This feature will allow you to find people’s Google+ profiles easily within Search. Start typing a friend’s name and Google will predict who you mean (Google Instant Technology) and also display information from their Google+ profile. Some prominent people on Google+ can also show up, partly thanks to the Google’s authorship pilot program. This integration enables you to follow interesting users directly from search. 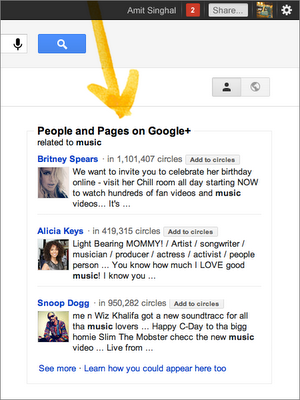 Notable Google+ pages and people will show up on related searches, allowing you to connect with whole new communities you may be interested in interacting with. I can see this being evermore important for use with brands in an attempt to get their pages to appear on generic searches above competitors. I can see this as a problematic area and being a real annoyance to the user in some cases, but I will reserve judgement until I have used it properly. What will be interesting to see is how this will affect PPC ads that may appear here. I predict further developments with Adwords being integrated into ‘Your World’ this year too. As previously mentioned, Google have made it simple to distinguish between ‘Search plus Your World’ and no personal results with a button positioned on the top right of the interface. Search has been made much more secure with the incorporation of SSL but it remains to be seen if how this will affect analytics and tracking packages. It will be worth monitoring the growth of Google+ and analysing the percentage of logged in Google users visiting your site. Hopefully the dreaded ‘not provided‘ search term will not increase too rapidly in Google analytics reports . There have been varied reactions regarding the new Google search features, with many SEO’s trying to make sense on how content will be indexed, and trying to gauge the exact size of the opportunity this presents. The good news for SEOs is that this social content is rich (more than 140 characters), indexed and backed by Google, and not behind a private wall as you find with Facebook data. All this is a clear indication that Google+ will be a Social Media platform worth investing in for many. 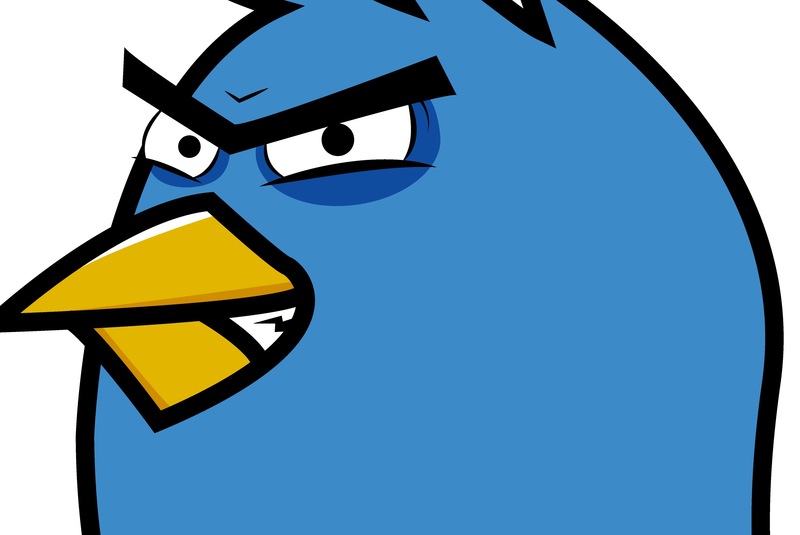 So some seem to have welcomed the changes, and others, such as a little blue bird, do not seem pleased at all. Twitter criticised the move, being concerned about the fact that users often find breaking news stories on twitter, and how these will not be part of this Google Search addition. Many Twitter employees saw the changes as a ‘bad day for the Internet‘. Google then responded, with the remark that it was Twitter, in fact, that had backed out of the data pipeline deal last year. Eric Schmidt, the Google Executive chairman, spoke with Danny Sullivan about this ‘war of words’ citing the fact that Google does not have the permissions to access twitter content, so that it can be treated the same as Google Plus Your World content. 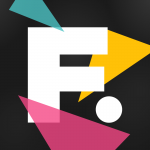 One way round this could be to syndicate your twitter feed to some other services, such as Friendfeed. Google still indexes lots of tweets anyway, it is just that these are not quite as real-time as when they had access to the Twitter firehose. How Will ‘Google Plus Your World’ Affect the ‘Filter Bubble’? One thing I found interesting was people wondering about the certain questions regarding social content, such as the ‘Filter Bubble’ concept, which was discussed in a recent TED talk by Eli Parser. The Filter Bubble concept is about online content which is automatically filtered out from in front of our eyes with algorithms, and if this is always a good thing. The point is that sometimes it is worthwhile to be exposed to information that will challenge us and can make us uncomfortable, and for this not to be hidden from view. Steven Levy of wired actually got in touch with Parser regarding the developments. Parser as it turns out, is pleased with the changes due to the apparent transparency and control, all of which addresses his previous concerns. Matt Cutts has wrote about his own experiences with ‘Search Plus Your World’, with an excellent example of what people might expect to see when performing a search with these new features. One thing Matt confirmed was that ‘Search Plus Your World’ does include public content from the web and not just Google+ posts. Matt gives example of content sourced from Flickr, Quora, Friendfeed and Livejournal. For me, I cannot see examples of ‘My World‘ in search yet, but I look forward to doing some tests when I can. One of the only problems so far is that Google+ still has low usage rates compared to Facebook, although in the digital world there seems to be a high number of regular contributors. If usage breaks through to casual users from these early adopters this year, I predict that we will see an interesting shift in people’s search and social behaviour online. Media and SEO, and certainly ‘a beautiful journey’. Here’s to 2012.